Soba is a type of buckwheat noodle that is popular in Japan, and enjoyed both on a daily basis and for special occasions. On New Years Eve Japanese people eat toshikoshi soba, which translates to ‘passing or crossing the year’, and is a longstanding cultural tradition since the Edo period to bring in good fortune, luck and longevity. When people move into a new residence, they serve hikkoshi soba to their new neighbors in a social and friendly gesture to introduce themselves. Soba noodles are frequently consumed in warm dashi broths with toppings which range from deep fried tofu, nameko mushrooms and shrimp tempura to dried herring and duck meat. Cold noodles may be topped with gooey grated tororo yam, grated daikon radish, natto fermented soybeans or deep fried tempura bits, but soba purists will generally opt for a simple zarusoba plate of chilled soba noodles with a tsuyu dipping sauce made of kaeshi and dashi to enjoy the noodles in its simplicity and purity. Soba is an integral part of life in Japan, from fast food standing-only soba stalls on train platforms that are frequented by salarymen in transit and zaru soba bento boxes sold in 7-11 convenience stores for office ladies in a hurry, to store-bought dried soba that is present in every household pantry. Soba at first glance may seem like cheap food of convenience from an outsider, but artisanal soba is a deep and complex art that few are able to understand and master. 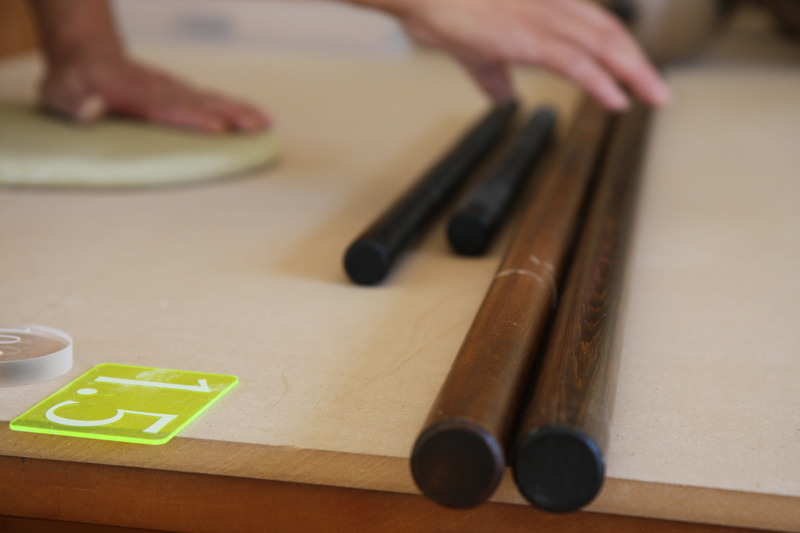 It takes years of apprenticeship and many more of real life experience to become a soba master, and it’s easy to tell when you’re having good quality soba that is made by an artisan. Fresh soba has a light and delicate flavor with just the right amount of koshi, which is a Japanese word for the elasticity and slightly chewy consistency that noodles are supposed to have, and a slippery yet refreshing nodogoshi, which is a word to describe the pleasant way that food passes down your throat. 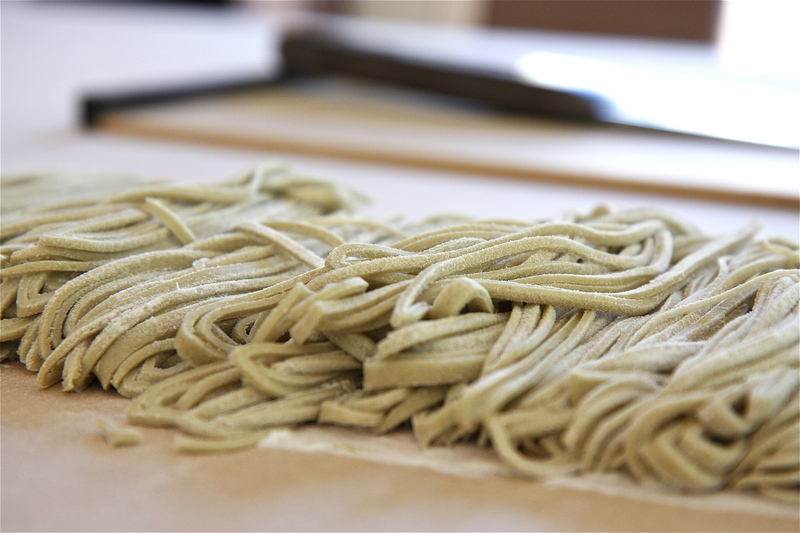 Soba is made only from buckwheat flour and water (and wheat flour for a combination soba), and nothing else, so it’s all in the skill of experienced hands to mix, knead, roll and cut these simple ingredients into good delicious noodles. 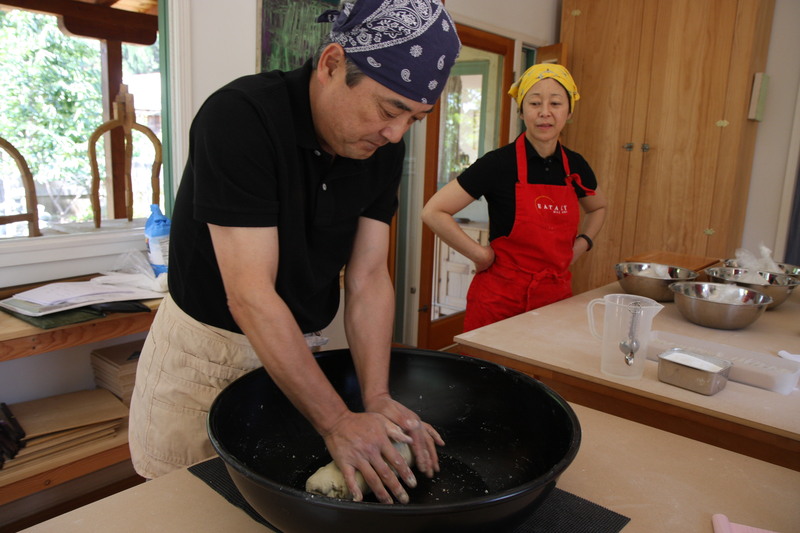 I recently took a soba making class with Akila Inouye, Master Chef and Founder of the Tsukiji Soba Academy and Sonoko Sakai, Japanese cookbook author and food writer, through an opportunity that I found on their website called mazumizu. Mazumizu in Japanese means ‘first, water (and everything else will follow)’, which is the Zen principle of simplicity and natural flow in soba making. They offer many different soba classes like the Easy Handmade Soba for Beginners for $85 and the Gluten free Kikouchi handmade soba class for $95, but I opted for the Basic Handmade Soba class for $125 that included a soba lunch. 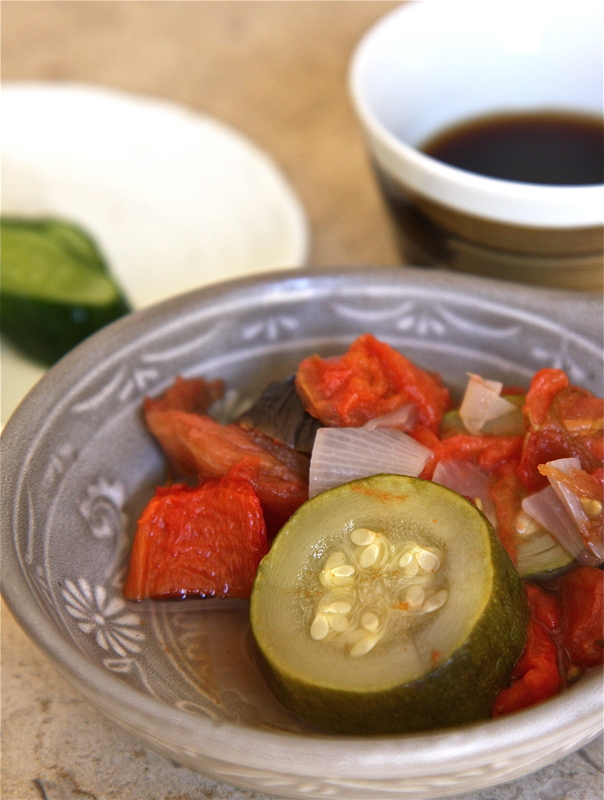 The class was held at Sonoko’s lovely house in Santa Monica, and all supplies and ingredients were provided. Akila Inouye, the Founder and Master Chef of Tsukiji Soba Academy in Tokyo, Japan, has been teaching soba making for more than 15 years, and has trained many soba artisans who have gone on to open their own restaurants. 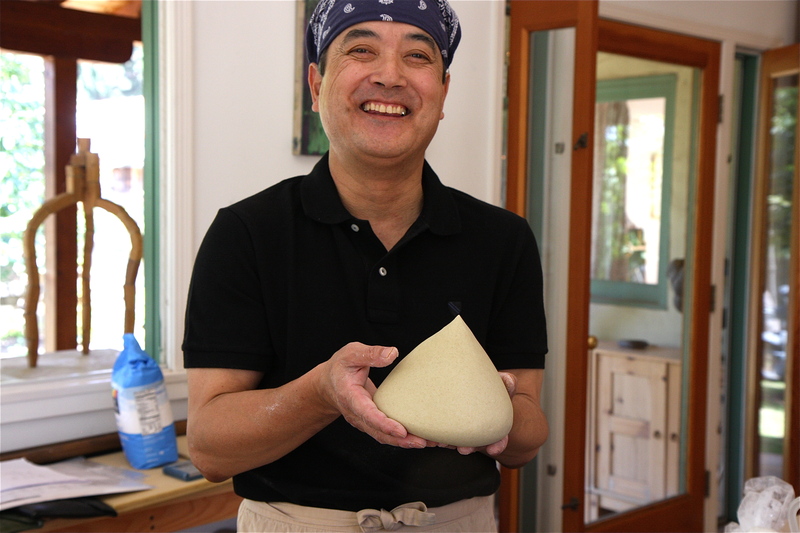 He conducted soba classes in Los Angeles last fall when he did a US soba tour from New York to the west coast, but by the time that I found out about this, classes were all sold out. I was ecstatic that he returned to LA for the whole month of June to hold all types of classes. He even brought different kinds of Japanese knives ordered and made especially for him, of which I was able to purchase one very special one. Sonoko Sakai is a Japanese writer and film producer who is bicultural and bilingual. She enrolled at the Tsukiji Soba Academy in Tokyo under the tutelage of Akila, and became a certified soba maker. Her passion for soba making drove her to convert her home into a soba teaching studio and to spread the culture of soba to Angelenos. What used to be the dining room is now a bright sunlit studio with 2 large wooden tables whose surfaces are perfect for rolling the soba. A cabinet holds an assortment of beautiful Japanese ceramics in which to enjoy the soba and side dishes, and a side table is stocked with rolling pins, lacquer bowls, measuring cups and flour brushes. With our aprons on and bandannas tied around our heads, our enthusiastic class of 5 was ready to knead and roll. Master artisan Akila demonstrated the entire process step by step as we all watched in awe. 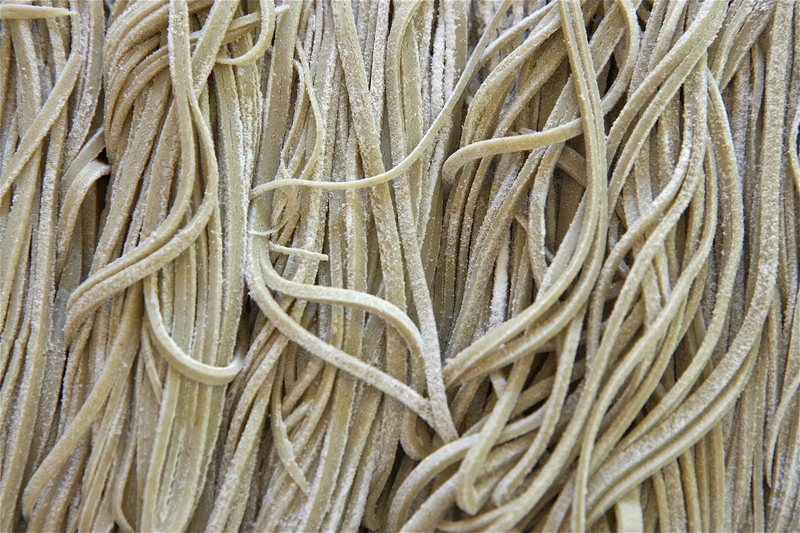 He prepared a 10 serving size of soba using 80% organic stone-milled Japanese buckwheat flour and 20% all purpose wheat flour in an 8:2 ratio of Nihachi soba which is the classic Tokyo style. 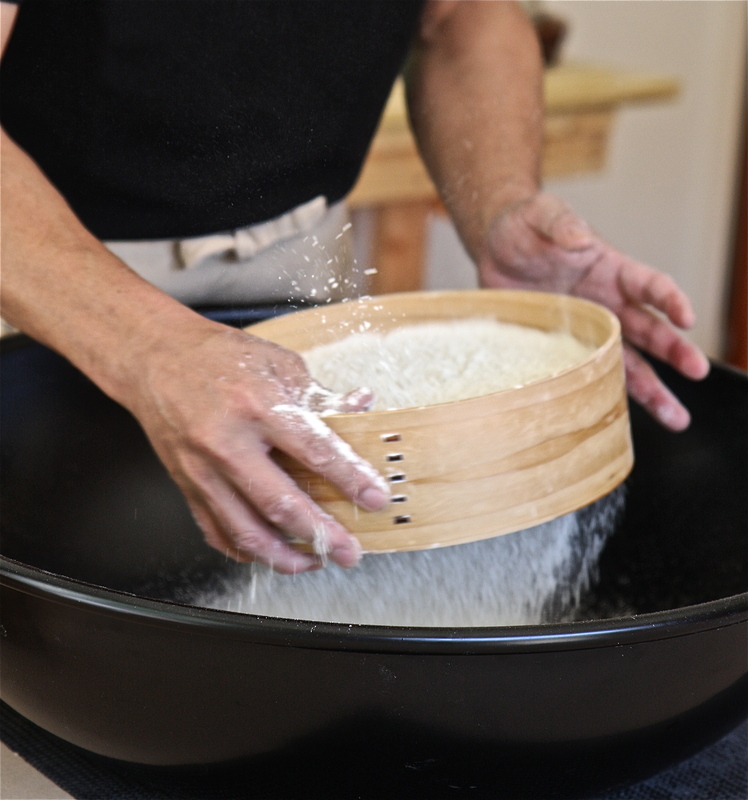 After he sifted the flour using a special fine sieve from Saitama prefecture, he started to explain the importance of water in soba making. Water is the only other ingredient in soba, and how much you add is the key element in the entire process. The amount of water to be added is not a finite proportion or weight, but largely depends on the flour quality and the humidity and temperature of the day. Too much water and the dough will never form; too little water and the dough will fall apart. The adjustment of water, unfortunately, is something that can only come from years of experience and professional intuition. 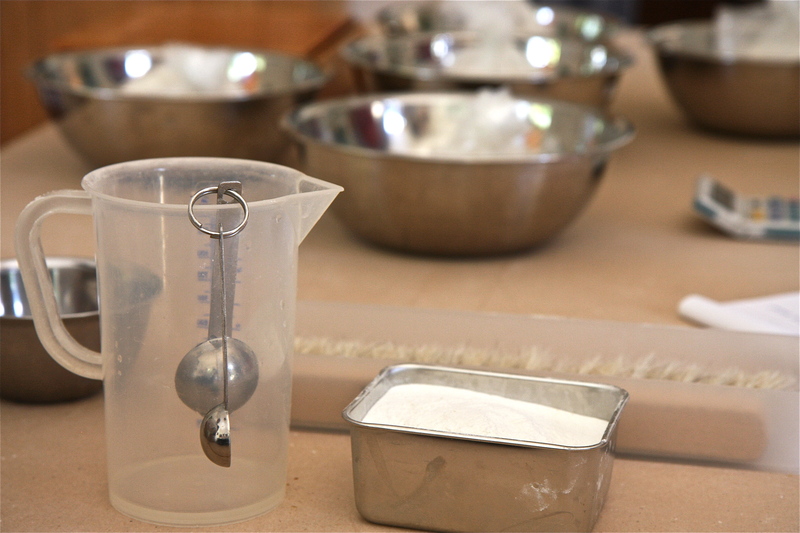 Once water is added to the sifted flour, use your hands to gently yet swiftly mix it up in a rotating motion. 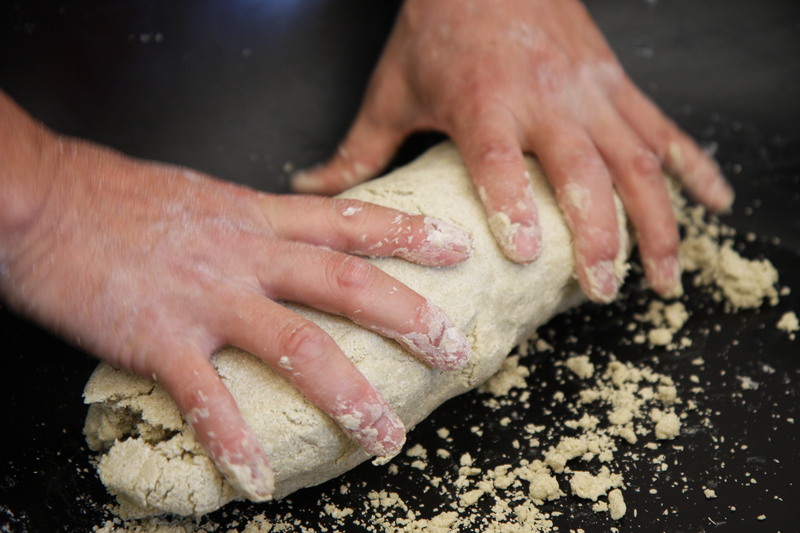 Once the mixture is moist yet crumbly, gather it all to one side and gently compress it into a solid oblong roll. Then repeat the process of fold and knead using the heel of your palms as you lean forward into the bowl with feet shoulder width apart. Gradually, the dough will come together and feel sticky. After adding just a touch of water, use your thumbs to knead with determination until it becomes soft, smooth and bouncy like a baby’s bottom. Shape and mold into a large Hershey’s kiss before flattening the top into a thick disc shape. 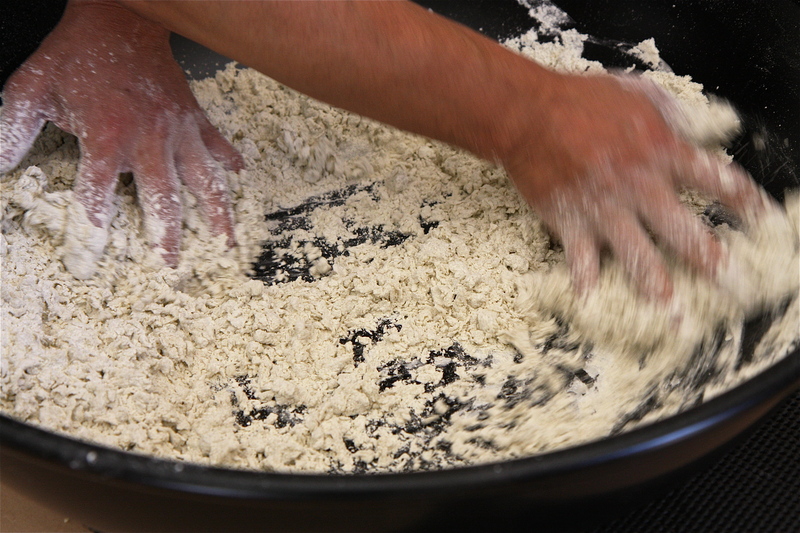 Sprinkle a bit of uchiko (like cornstarch) on the table and lay your flattened dough on top. 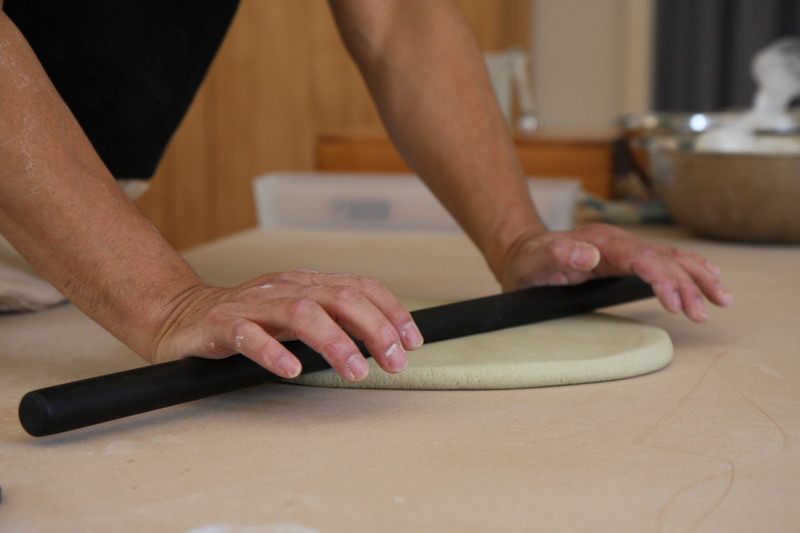 Use a rolling pin in smooth swift motions going in all directions to flatten the dough. Flatten into a rectangular shape, sprinkling bits of uchiko as you go along to prevent sticking. 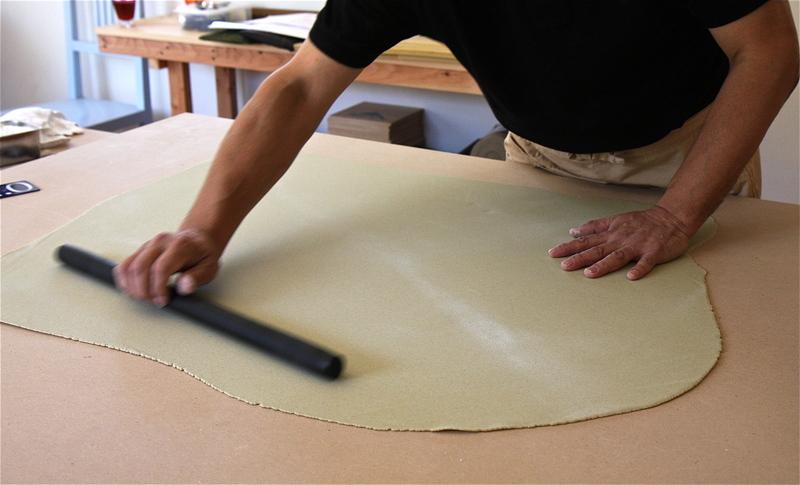 The goal is to roll the dough into an even 1.5mm thickness. Master Akila made it seem so easy and effortless, and little did we know how difficult this was going to be when it was our turn. 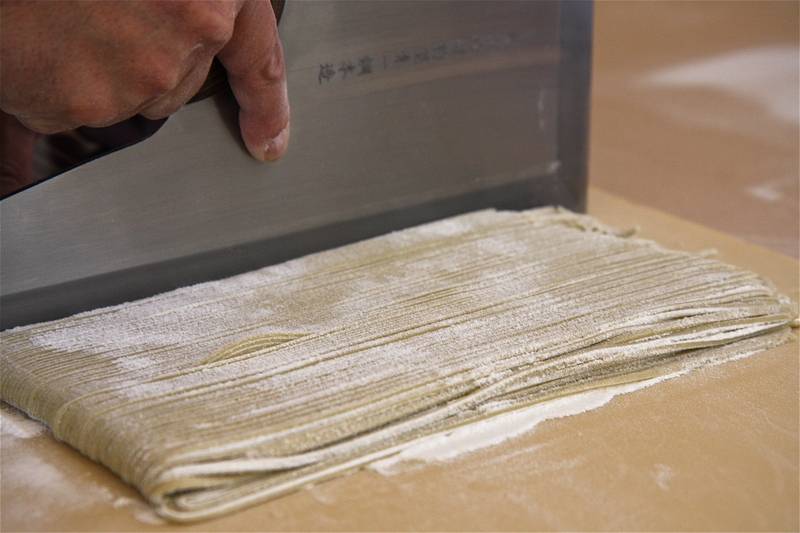 Fold the dough in 4 layers using generous amounts of uchiko in between each layer to prevent the noodles from sticking to each other. 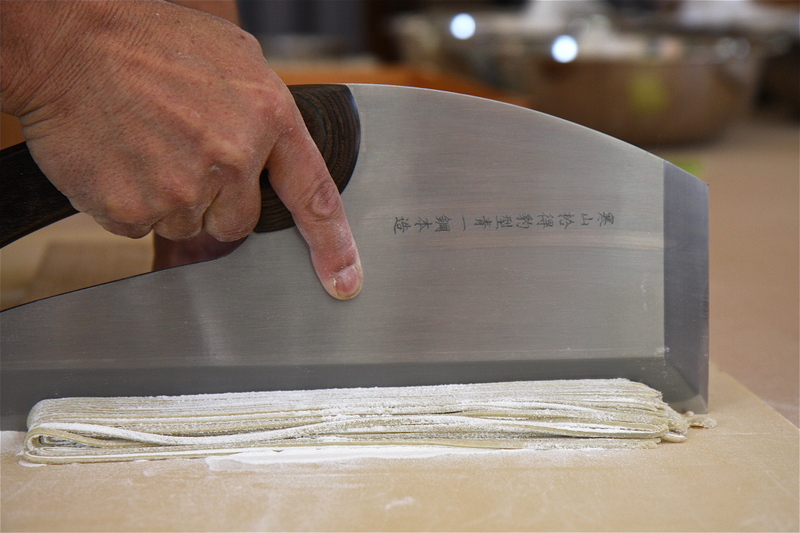 Using a special soba kiri cleaver that has a long and perfectly straight and even edge, cut the soba in even widths in a relaxed posture. Needless to say, our jaws dropped and we all fell silent when we watched Akila cut the soba with ease and grace. We were all petrified at having to do this ourselves. After an intense but fun soba making session, we sat down for a wonderful lunch in Sonoko’s kitchen. While we were making soba, Sonoko was busy in the kitchen making dashi broth with bonito flakes and preparing the dipping sauce. Rattatouille of zucchini, tomatoes, eggplant and onions were cooked by a simple process of steaming with only a pinch of salt for seasoning- it was rich in flavor and absolutely delicious. Soba (made and cut by our teachers, of course) was served in a cold tsuyu sauce with duck tsukudani simmered in soy sauce and ginger, Tokyo negi scallions, deep fried eggplant suage, sliced myoga ginger and mitsuba leaves. I thought that the soba at Otafuku in Gardena was the best soba that I could get in Los Angeles- I was wrong. This handmade bowl of soba by artisan Akila Inouye was not only the best soba that I’ve had in LA, but by far one of the best that I’ve ever had in my life, rivaling my favorite joint in Tokyo called Souhonke Sarashina Horii in Azabu-Juban. 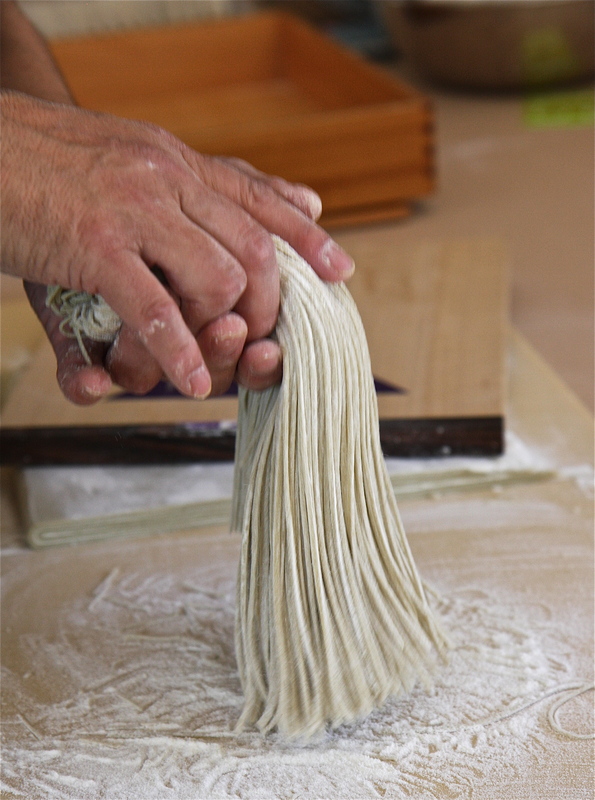 To be able to learn how to make real Japanese soba is one thing, but to learn from a true artisan in the comfort of the teacher’s beautiful home and kitchen is such a treat. 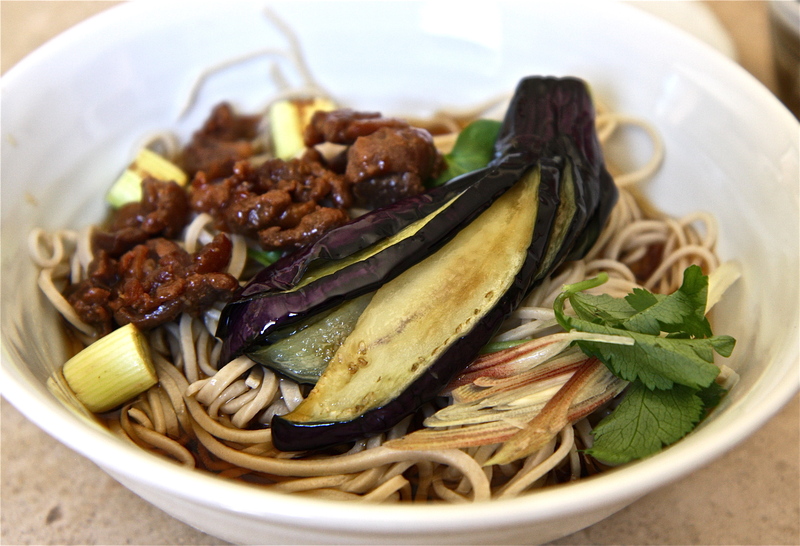 I will never forget how that special bowl of soba with eggplant and duck meat tasted, for it’s attached with an unforgettable memory of my first experience with creating this traditional Japanese comfort food with my very own hands. 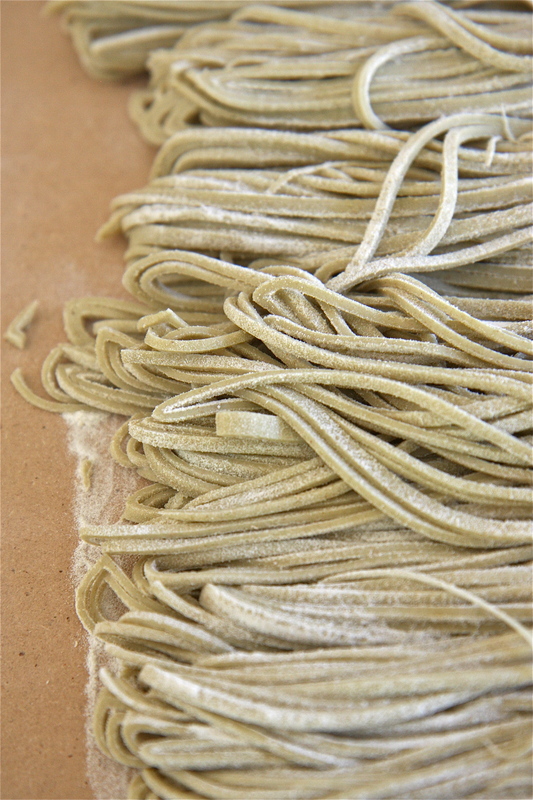 The following day I boiled some of my handmade soba for a simple zarusoba lunch at home. Due to the unevenness of the noodles, it wasn’t first class, but knowing that I made it completely from scratch, it tasted delicious and comforting. I regret not having enough time to take more of Akila and Sonoko’s classes, such as the seafood dinner party and summer entertaining classes which include sake tastings, but I’ll always have fond memories of this one magical sunny morning when their passion for soba touched and changed my life. 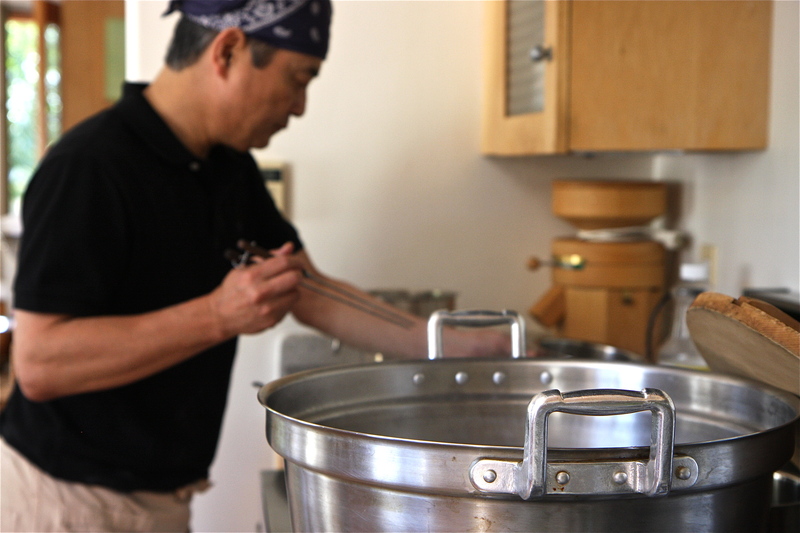 Soba master Akila Inouye is back in Los Angeles for more soba making classes. 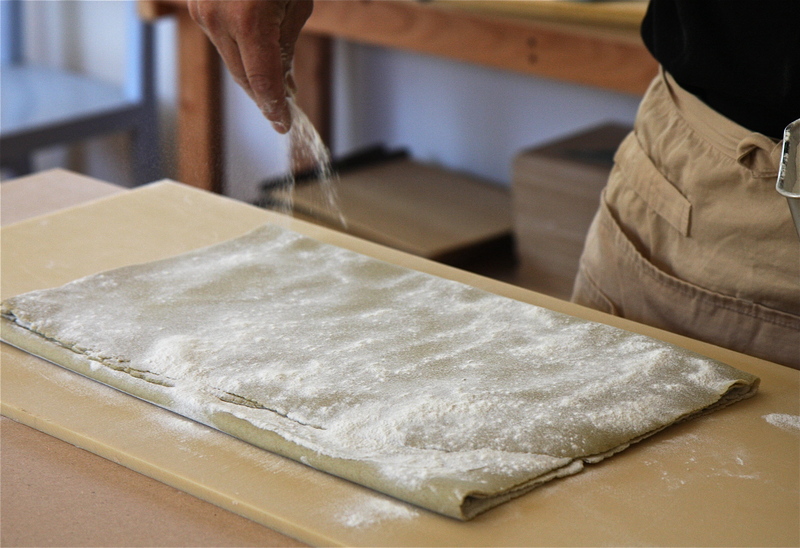 This time around they are offering a class where you can mill your own soba and literally make everything from scratch. Log on to www.mazumizu.com to register for these classes at the end of August- for one week only, so register now before they sell out! Soba master Akila Inouye and Sonoko Sakai will also be doing a pop-up soba event using Shin-soba from Japan at the Breadbar for 1 week only at the end of August! Random trivia: Soba noodles contain antioxidants like rutin and quercetin, and essential nutrients and amino acids like choline, thiamine and riboflavin. A lot of these nutrients and vitamins are lost to the water when boiling the soba, so there’s a tradition in Japan of drinking the left over water, or sobayu, at the end of the meal. This entry was posted in Cooking with friends, Los Angeles- Culture and tagged Akila Inouye, Los angeles, mazumizu, soba, soba class, Sonoko Sakai, Tsukiji Soba Academy by tomostyle. Bookmark the permalink. the new background behind your title is totally soba-rrific! It was about time that I changed that beautiful but boring sky background! That is beyond cool. too bad so few soba shops in LA still make their own. It does look like a total pain, something you can’t be taught simply in 1 class… Love Otafuku’s soba-yu. One soba class has me shaking with excitement. I can’t imagine what the second will do! Thanks for your comment SinoSoul! They are doing classes this weekend and next week. He will also be back in October. Keep checking their website for the class schedules. It’s fun!